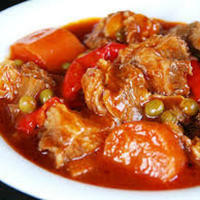 A twist of my favorite caldereta. Heat the olive oil and butter over medium to high heat in a heavy sauce pan or Dutch oven. Just heat until butter is melted. Sear the beef chunks on all sides. Do it in batches if they won’t fit in the pan. Set aside. In the remaining fat, sauté the garlic cloves and chopped onions for a minute. Add the diced tomatoes and cook for about 3-4 minutes or until the tomatoes have softened a little. Return the beef to the pan. Stir everything. Season with salt, pepper and fish sauce (if using). Add the bay leaves at this point. Pour in the beef broth or water and the coconut milk. Bring to a boil. Lower the heat, cover and simmer until the meat is fork tender about 1 ½ -2 hours. Stir occasionally during cooking. If by any chance, the stew dries up just add a little water or beef broth. In the meantime, fry the chopped potatoes and carrots. When the meat is already tender, add the potatoes, carrots and bell peppers. If using some chili peppers, add it at this point. Continue to cook for about 5 minutes or until the bell peppers are tender. Stir in the and tomato sauce. Simmer until everything is heated thoroughly. Adjust the seasoning with a little salt or fish sauce, if necessary.